Calculations at an ellipse. Enter the two semi axes and choose the number of decimal places. Then click Calculate. The semi-major axis is the distance between center and one point on the ellipse furthest away from this. 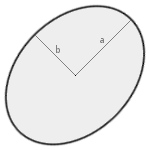 The semi-minor axis is the distance between center and one point on the ellipse closest to this. They are upright to each other. The linear eccentricity is the distance of the focal points to the center. 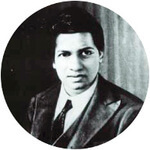 The circumference is calculated with an approximation formula (second approximation of Srinivasa Ramanujan), which is very exact up to ε<0.9 and has a maximal error of 0.04% at ε=1. An exact calculation can be done with elliptic integrals (Jacobi integrals), whose values can be taken from tables. Semi axes, linear eccentricity and circumference have the same unit (e.g. meter), the area has this unit squared (e.g. square meter). Numerical eccentricity is dimensionless.